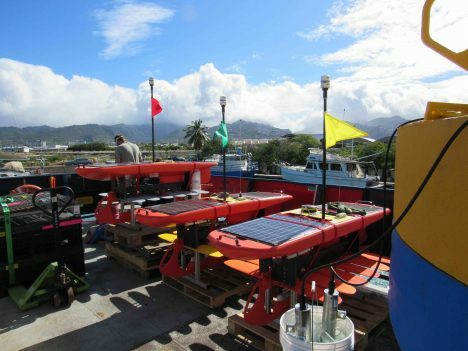 Our wave gliders, ready for action. Fieldwork in physical oceanography, like many sciences, requires enormous preparation followed by a shorter very intensive period of action. SPURS-2 is no exception. The work over the next six weeks has been in the planning and staging for several years. Now, all the gear and scientists have reached the ship and we are on our way to completing all of our the carefully laid plans. It is tempting to express the mood aboard the R/V Revelle as a great sense of anticipation. From discussion around the ship, it seems like no one has seen a voyage with these many sensors and equipment installed aboard this ship. There seem to be instruments mounted everywhere from bow to stern! And, of course, the scientists and technicians are deeply interested in what each sensor will tell them and what kind of scientific discoveries will emerge. These instruments are designed to see the delicate slow dance between the ocean and atmosphere around the ship over the coming weeks. Other gear will be deployed to continue the careful watch on ocean and atmosphere for the next year. All our time and investment is focused on understanding the aspects of this “slow dance” that involve water exchanges between ocean and atmosphere. In the atmosphere we will be looking at the characteristics of rainfall and evaporation at the sea surface. In the ocean we will be study the characteristics of the temperature and salinity patterns induced by the rain. These interactions are a newly accessible field of study resulting from the advent of satellite rainfall and salinity measurements and new shipboard tools for studying the upper few meters of the ocean. 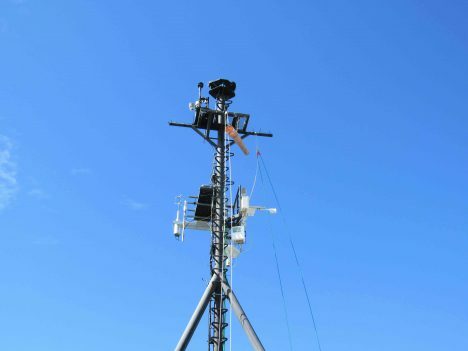 One of the numerous meteorological masts installed on the R/V Revelle for SPURS-2. All the scientific party on R/V Revelle likely feel some sense of adventure, since the precise nature of what we will see and discover is a matter of conjecture. We do know from the Aquarius satellite data that there is a large pool of relatively fresh water built up seasonally at the surface of the eastern tropical Pacific north of the equator. Oceanographers are curious as to how this pool is trapped in the region for part of the year and how it is seasonally released to the west. As physicists, we are tackling the problem by careful examination of the individual processes that bring the water into the ocean (rain), maintain the fresh pool in the ocean (dynamics), and subsequently release the water to the west or to the deep (dynamics and mixing). If we knew the answers, it wouldn’t be research. The unknown beckons! The combined feelings of curiosity and anticipation –and that our work may result in deeper understanding of nature–, just seem to make this feel like an adventure! The chief scientist of SPURS-2, Andy Jessup, is ready for action too. So here we are, all primed for discovery but with five days more to go before being where we really want to work. We are like kids in the back seat of the car asking “are we there yet?” Every piece of gear is at the ready and the teams are completing their training. We are doing dry runs to iron out the deployments of new devices that just have not seen that much action. In later entries, I’ll introduce you to the Sea Snake and the Surface Salinity Profiler and the Lighter-than-Air InfraRed System (LTAIRS), a balloon. 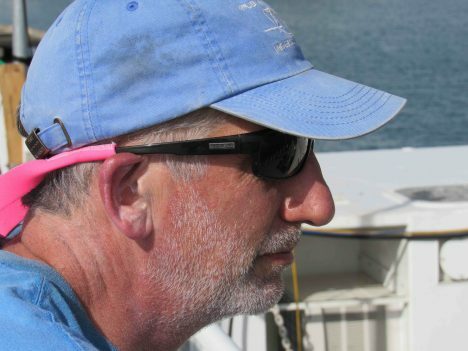 These are very new ways of examining the air-sea interaction near the ship. They will be used in conjunction with many of our standard tools – drifters, wavegliders, and moorings, for example. We hope they will lead us to deeper insights about the water cycle at the ocean surface. I will give you a preliminary view of what is discovered during the week-long return voyage to Honolulu at the end of September. For now, we simply prepare for action! This entry was posted on Wednesday, August 17th, 2016 at 3:03 pm and is filed under Salinity Processes in the Upper Ocean Regional Study (SPURS). You can follow any responses to this entry through the RSS 2.0 feed. Both comments and pings are currently closed.